For this recipe the polenta should be prepared in advance or you can use the advanced search by another preparation (perhaps made especially for the occasion in abundant doses). Arrange the polenta sliced and slices on individual plates: can be used at will either at room temperature or heated. Chop and sauté in a pan the onion, adding the Basil and leaving it on the stove for a few minutes until it is soft and golden. Add the diced tofu and savory. Pour the tofu on polenta and sprinkle with vegan mayonnaise (at room temperature) and poppy seeds. 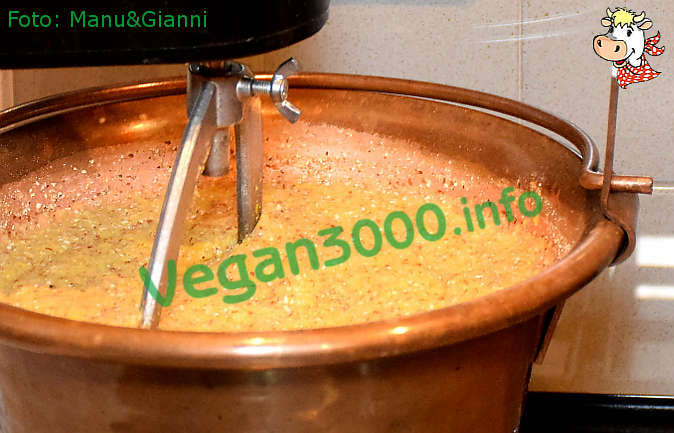 To prepare a Traditional polenta faultless, requiring at least 40 minutes baking in a copper pot and be stirred continuously does not form lumps, recommend the use of the electric pot for polenta.